One of my biggest challenges as a teacher is to relinquish the floor. I am not proud of it, but being aware of it has helped me find ways to cope with the allure of being the sage on stage. As I work with language learners who are increasingly proficient, I’ve realized they need more opportunities for authentic production, with opportunities for reflection and self-correction. In a very real way, this is a #humblebrag, since our students get so linguistically advanced because I am lucky to be part of an incredible team of linguists/teachers who get them going early. By the time they get to me, they are NOT in the mood to do a family tree, tell me about their daily routine, or discuss their childhood while illustrating correct usage of imperfect vs. preterite. What’s a simple profe to do? Turn them into the teachers! That’s what! I teach a class of intermediate high to advanced-mid language learners, who have been loved and supported through their monosyllabic stages all the way to their complex multi-clause sentences in the subjunctive mood -pluscuamperfecto. Often, one of the biggest challenges I have is to find a meaningful balance to develop all areas of language. Of course, it is not realistic to isolate one skill; I want to get the most buck for my money. One approach I have used in order to get the most bang for my lesson planning struggles is to design tasks that can touch on as many of the Cs as possible simultaneously. Enter the peer editing approach with stations.This approach can be adapted to several types of learner and levels in the continuum of language acquisition. If anyone is playing the TELL Project bingo, this idea touches on LE1, LE4, LE5, and LE7. If you are very competitive, you get extra points by noticing that it also touches on C2, PF1, PF3, PF5, and a sprinkle of PF2. Peer editing is a technique to enable students to be the experts while also exposing them to what well-written work can look like and feel like. It is in these opportunities to peer edit each other they start recognizing errors and patterns that they were not seeing in their own work. They take turns in each station, as the one giving or receiving advice. In this way, they develop a heightened sense of empathy and responsibility, in other words, keep it kind, and honest. An easy way to support their roles as editors and listeners is to adapt this wonderful idea from Elena Giudice, published here as well: Clashing the personalities in the target language. Setting up these stations, getting ready for the roles, preparing them with rubrics, and sharing goals with my students allows them to take a peek behind the curtains and see what teaching or mentoring feels like. So often they think we are these beings who do nothing else but exist in the classroom. This approach builds more understanding of what it takes to be a teacher and to say difficult things to people we care about. This is one of many options. Reading out loud, work on pronunciation. Individually record your reflection of the process and what you got from each station, as well as in general, from this process. The final station: there, a student records their narration reflecting on the feedback from several stations. 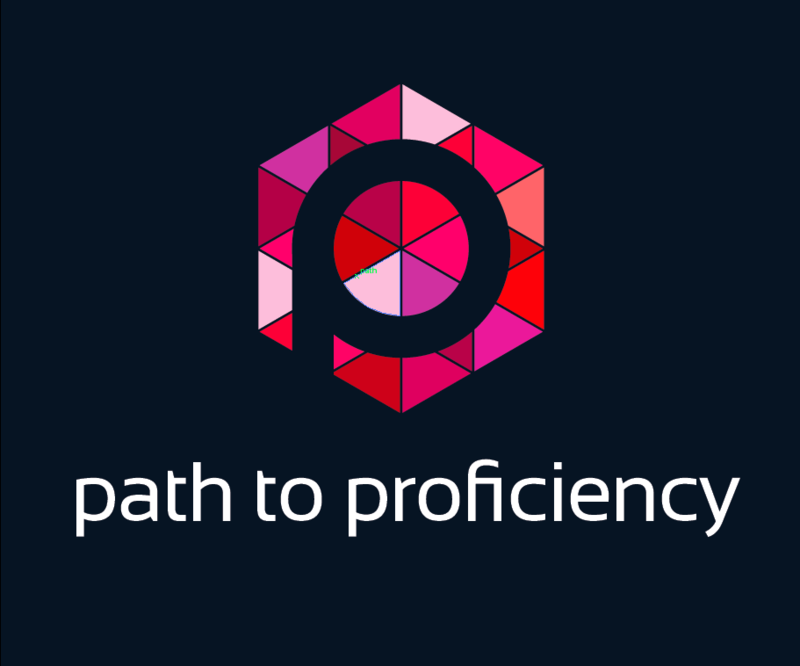 You can follow with your own recorded feedback on pronunciation, message, accuracy, variety of language, intonation, etc. Using the data from this same station, you can have students listen to their own recording a week (or longer) after they recorded it, and re-record it, having had time to ponder on the experience, build on the actual feedback they got, or polish their pronunciation. Still working with the data from this station, you can have them listen to other classmates and leave a message responding to them. This experience gives them an idea of how to improve their future performance and determine their steps forward. They are now in charge of their learning. Who did that? You did! Which means you are very much in charge, yet not at the forefront of the classroom experience. You might even get to sit down for a period longer than 5 minutes. Enjoy that cup of coffee your poured yourself a few hours ago. 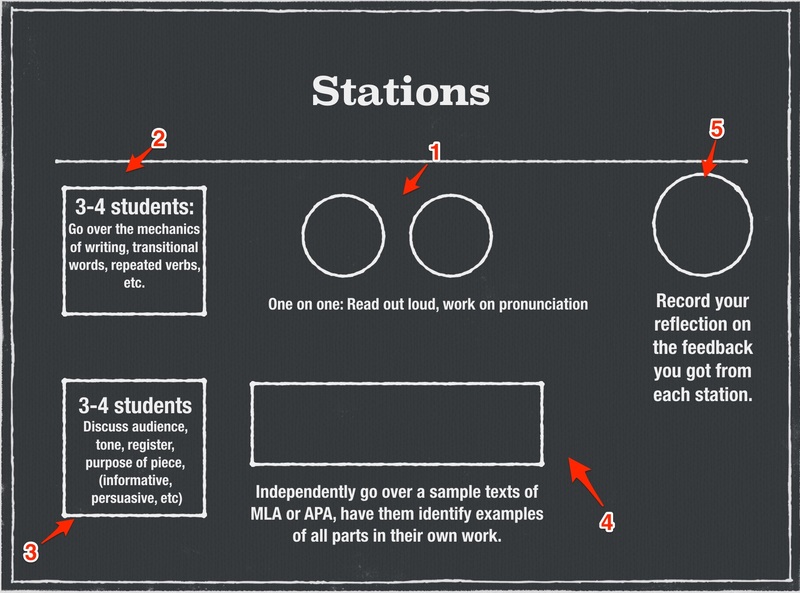 Routinely using these stations removes the “front” of the classroom, where you can tend to gravitate, helping you use your role to strengthen your students’ voices while sparing your own vocal cords. I used to think that the teacher had to lecture, correct, and lead every conversation. It is how I learned, and it worked for me…But now I understand that for a teacher to lead, we don’t have to be that obvious as long as we are deliberate. Preparing the task, working on the rubrics and sharing them with students, explaining their roles as editors and what type of feedback to give in each station, demonstrating what are good listening skills and reflective practices can take time, but you are equipping them with life skills, not just syntax. Though the use of these stations takes time for everyone to get comfortable with, it is worth it. It took even longer for me to accept that my role was to encourage them to continue working in the target language and clarify the occasional question, but mainly “to do nothing” while they work. Once you get over what you think a teacher should be doing, and create the conditions for learning, you find that there is nothing wrong with relinquishing the floor… and if you are concerned with you not doing enough, do not worry, those rubrics are not going to grade themselves! Carolina Seiden, P.hD., is a passionate linguist, curious teacher, and adoring beagle mom. She is perpetually flawed and fortunate to have forgiving friends and colleagues. Currently, she is working as a language teacher and support staff for teachers’ use of technology in learning. I extremely enjoyed this article. I this group stations are a great interactive way to keep students active and learning to information. This allows students to practice the different modes of communications, which is essential in order to learn the target language.